Masterpiece. A place that blows your mind; a work of art or object that speaks to you; or even a location or scene that’s special, unusual, or even magical in some way. Out of seemingly inhospitable and hostile desert land, lined with sheer red sandstone cliffs, in a country now known as Jordan, the Nabataeans carved out a civilization that hosted thirsty camels and trade caravans for several hundred of years (312 BC to 106 AD). In its heyday, the Nabataean population ranged between 20 and 30,000 people. The Nabataeans tamed the flash floods that taunted the area and captured water in cisterns, dams, and water conduits carved in the rock (you can still see these conduits today). 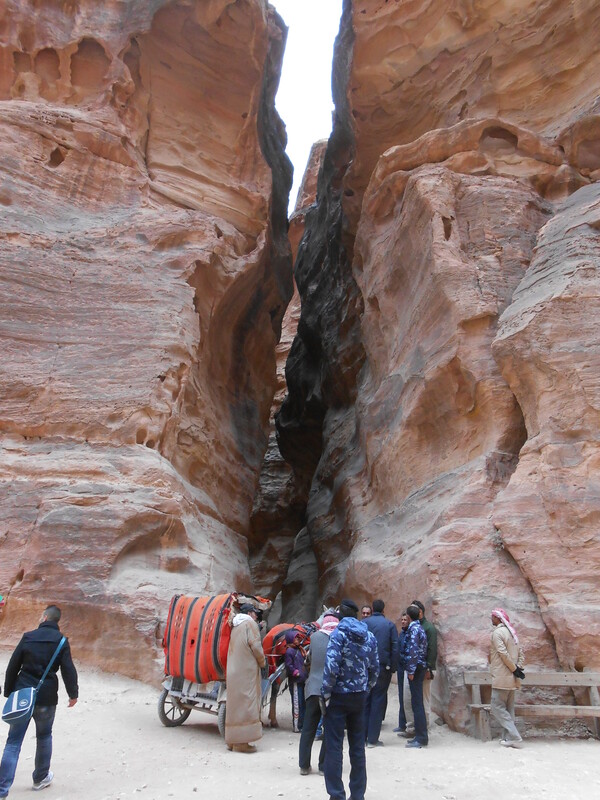 The biblical Spring of Moses also provided water for the Petra Basin. 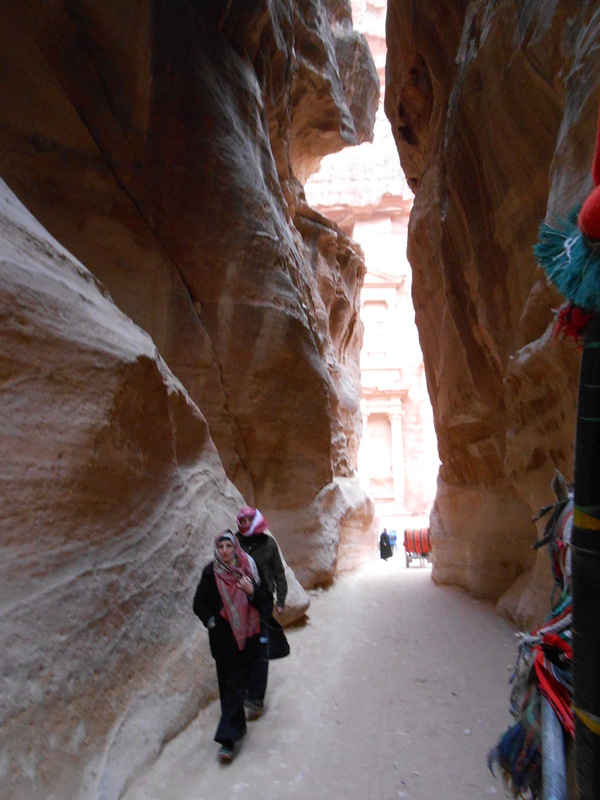 Settled since prehistoric times, Petra grew to be a major trading center between the 3rd century BC and 1st century AD. 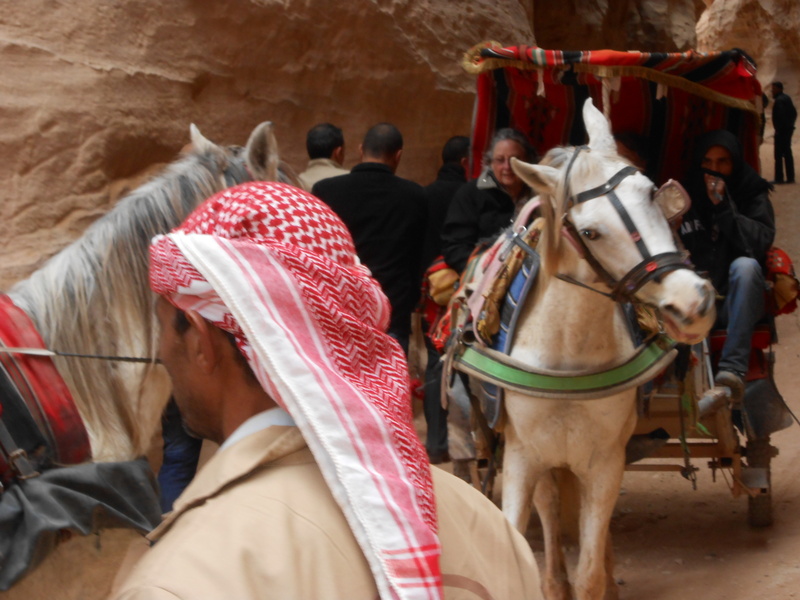 To the north from Petra, traders linked to Silk Road at Damascus heading to India and China. To the west at Gaza on the Mediterranean and Aqaba and Leuce Come on the Red Sea, traders carried their valuable cargo and connected with sea routes to Greece and Rome. 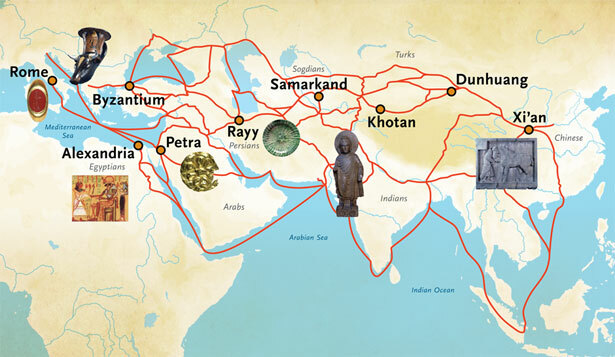 To the south, traders came and went to Arabia and Egypt. To the east, traders headed across the Sinai desert to the Persian Gulf and on to India. After the fourth century, the city declined due to earthquakes (363 AD) that damaged the water system. In addition, the Romans changed the trade routes and relied more on the Red Sea ports close to Egypt to transport goods. These changes ended Petra’s dominance in the area. The city was essentially forgotten for hundreds of years until Joseph Ludwig Burckhardt, an explorer on his way to Egypt, investigated rumors of a lost city and rediscovered Petra in 1812. Now Petra is a tourist area with between 50,000 and a half a million people visiting it each year, depending on the political climate. 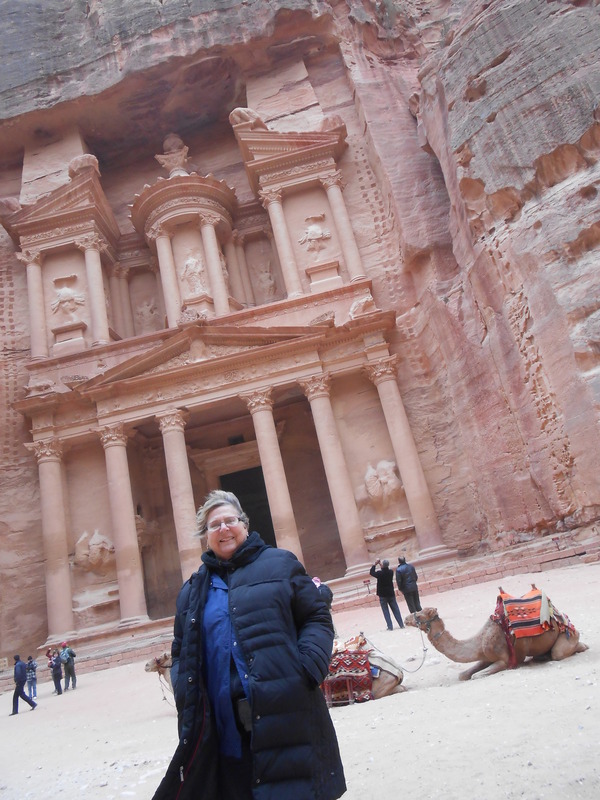 I visited Petra in December of 2012, and President Obama visited in March of 2013. 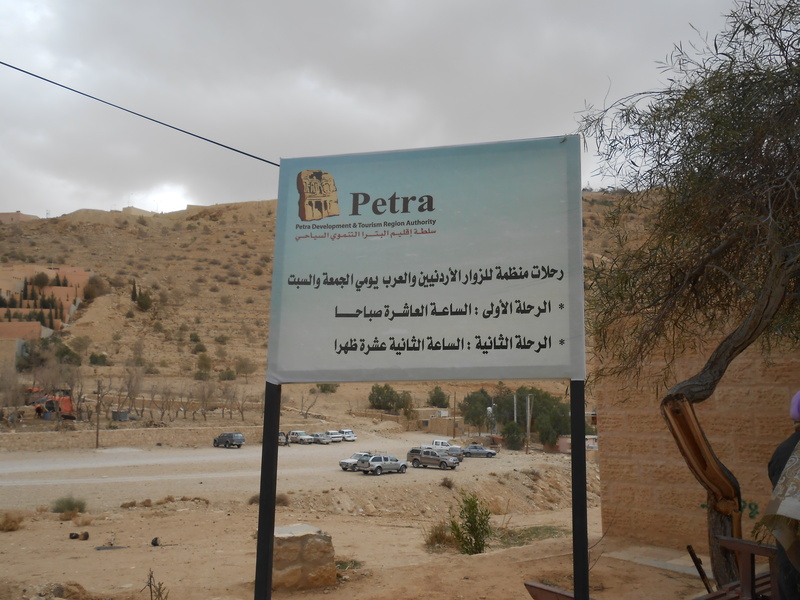 We reached Petra, 160 miles from Amman, the capital of Jordan, via the Desert Highway (Route 15) traveling in a mini-bus with our small group of seven travelers, one guide, and the bus driver. 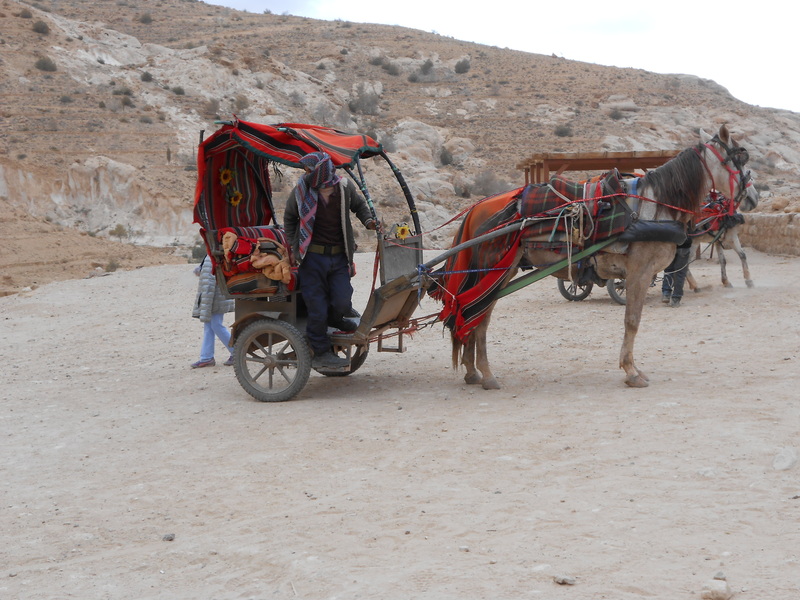 We returned to Amman via the slower route via King’s Highway (Route 49), stopping at the Dead Sea and Mt. Nebo along the way back to Amman. Small crowds at Petra that day meant that we could ride in the horse-drawn carts through the half-mile hard-packed dirt trail to the major site. Donkeys are available for transport purposes, too. 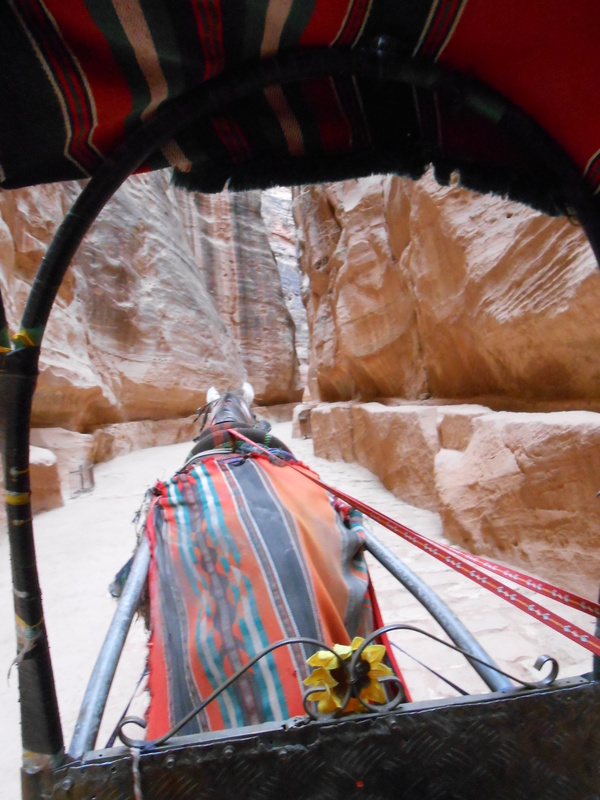 Enter Petra through The Siq, a narrow split in the red sandstone mountains. Two of us held on, yes, for dear life, to the flimsy canopy braces in the weathered and beaten horse cart with its wizened driver and its smelly, impatient-to-get-going horse. We rocked and jolted along the uneven dirt path, holding our breaths as much as possible, taking shallow breaths when critical, down a path just wide enough for two carts to pass each other. In places where the ravine narrowed, one cart had to give in to another, more aggressive driver, playing chicken as it were, to go through the narrowest area (about a meter wide). Through the break in the ravine walls ahead, we caught a teasing, un-focused glimpse of what was to come. And here is the masterpiece: The Treasury, carved in the rock in the 1st Century BC. Designed by Hellinistic architects, the Treasury stands majestically as the major feature of this wide gorge at the end of the Siq. 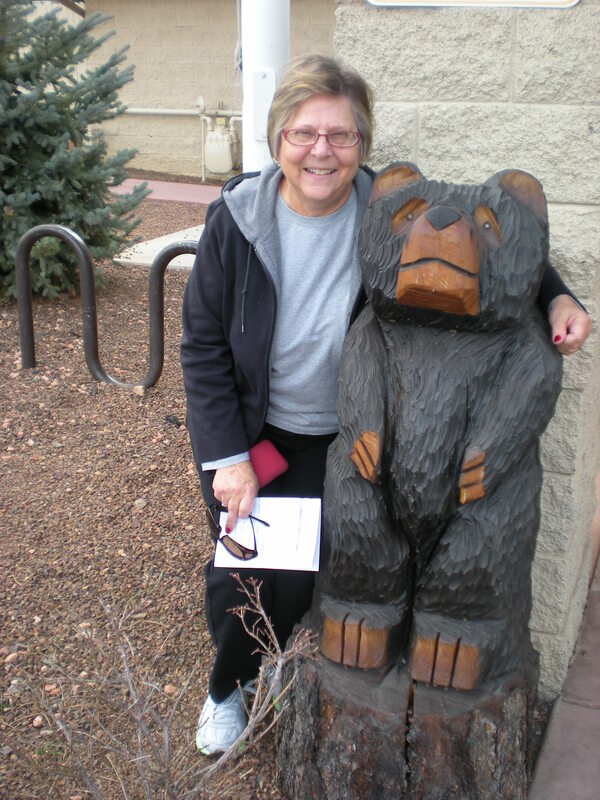 And of course, here is the obligatory tourist photo taken on that cold, windy day. Later, on March 23, 2013 President Obama visited this same site on his trip to speak with King Hussein of Jordan. Of all the places I have visited, Petra is number one on my list as the most spectacular, the most unusual, the most magnificent, and the most fascinating historical place of all. And I must admit, the horse cart ride was a once-in-a-lifetime, hilarious event. 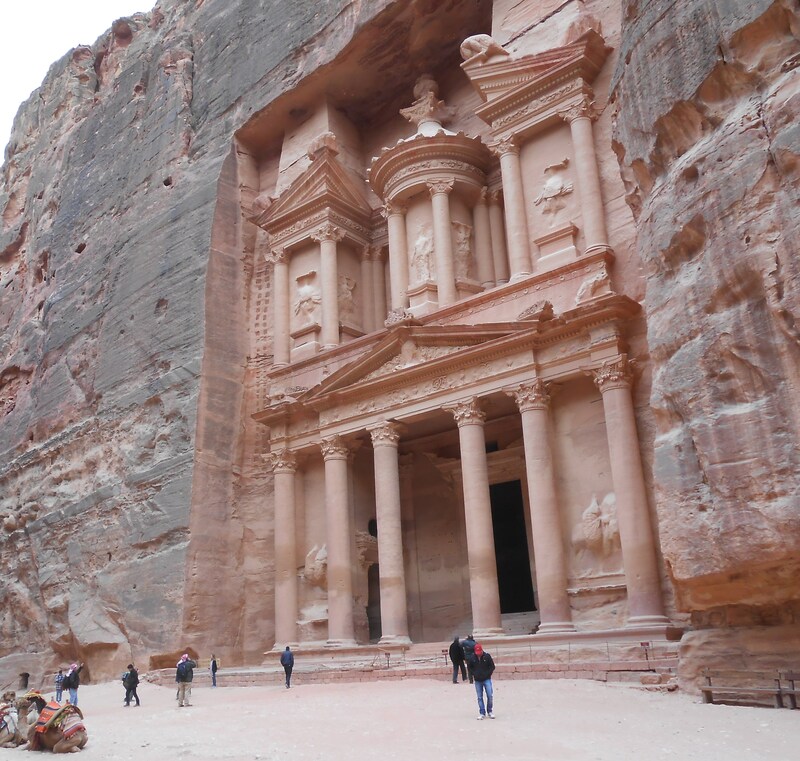 The Treasury building is just at the beginning of this trek, but there is so much more to see here, Perhaps I will do another post on Petra in the near future. 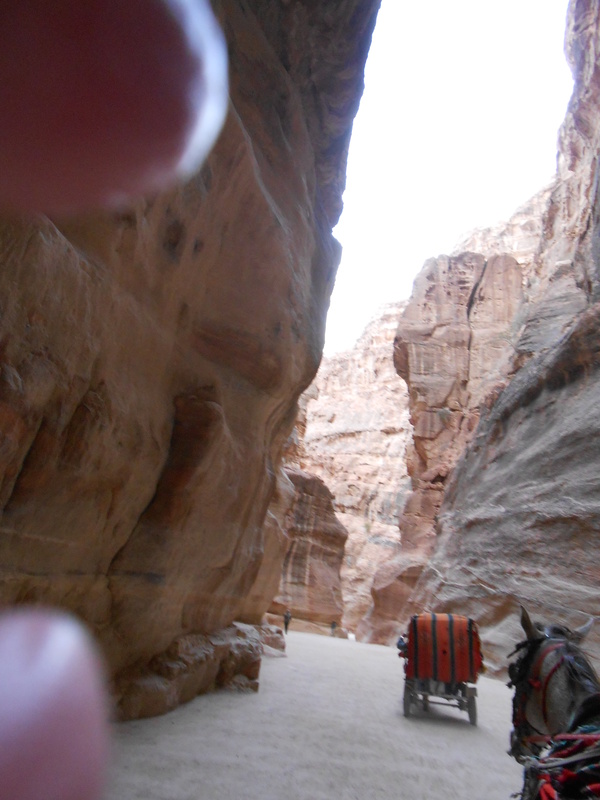 Well, yes (yawn), Petra is interesting. 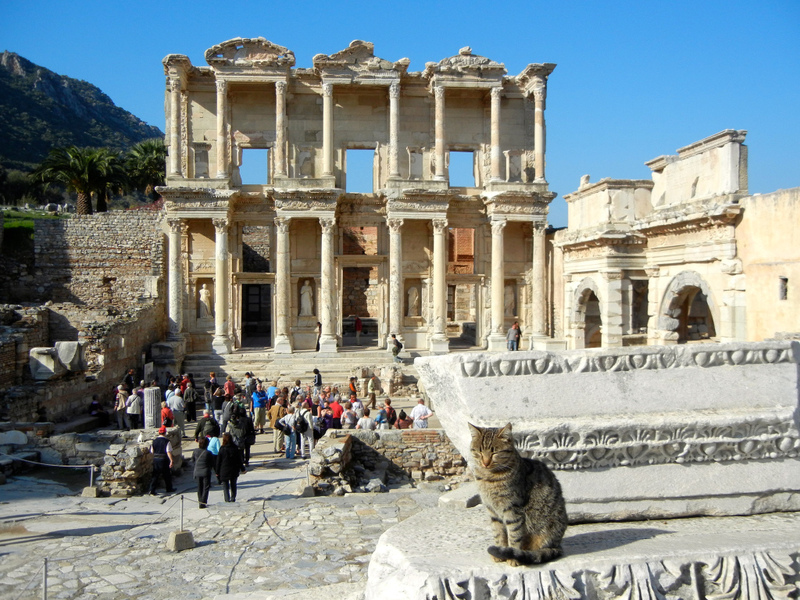 But I rather like the ruins in Ephesus. 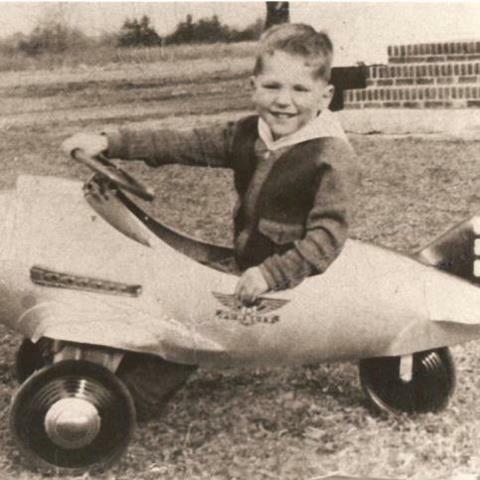 Don’t you think this picture of me is grand? 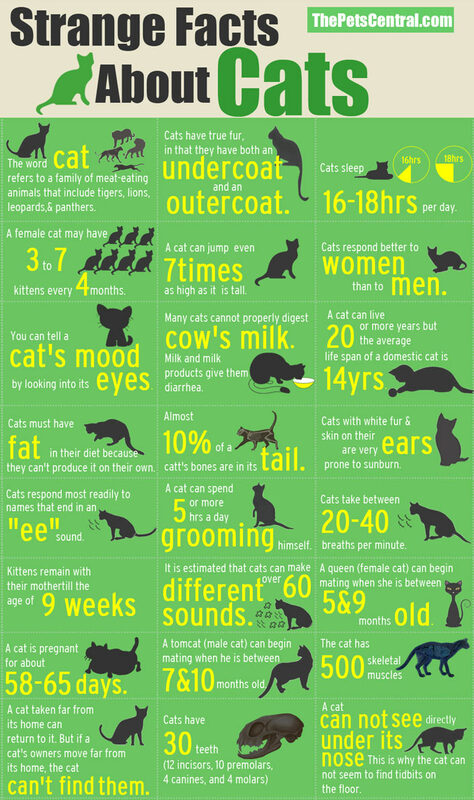 I came across this fun infographic on cats today – full of interesting facts, I bet, you didn’ know about our favorite furry friends! 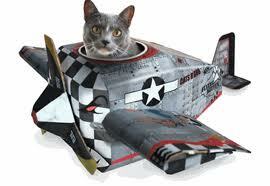 For example, did you know that cats take between 20 and 40 breaths every minute? 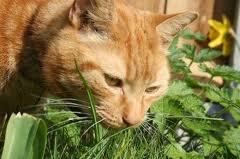 Or that cats can’t see under their noses, so they struggle to find food when it is right under their nose? So cool! What facts shocked you most? 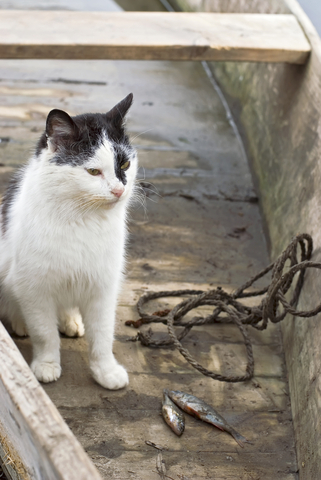 What other fun facts about cat do you know? 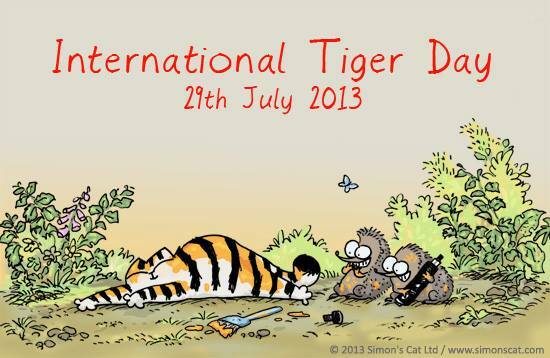 Simon’s Cat reminds us that today is International Tiger Day! Did you know Tiger Day is held annually on July 29 to give worldwide attention to the preservation of tigers? It was founded at the Saint Petersburg Tiger Summit in 2010. At that time wild tigers were dangerously close to extinction. In the last 100 years there has been a 97% reduction in their numbers. Today has been established to raise awareness of their vulnerable position and to celebrate these amazing animals. You can find out more at TigerDay.org. Thanks, Simon’s Cat for this information. Hey, Don’t forget about us. When is our day? Huh? C’mon. A tiger’s a tiger, and a cat’s a cat. We need our special day, too. What? You mean there is a National Cat Day? Well, now we’re talking. 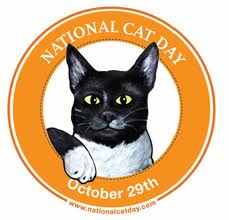 Two National Cat Days? Wow. June 4th AND October 29th? 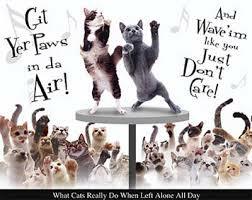 And World Cat Day is August 8, 2013? Hey, that’s coming up! Woohoo. That gives us less than two weeks to plan a doozy of a party! We is famous! We is famous. Let’s party! What? 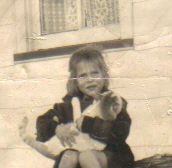 Russian cats have their own International Cat Day? March 1, 2013? Well, I think they’re gonna have to share that day! But for now, I’ve gotta get ready for the big party on August 8th. C’mon Grumpy Cat. It’ll be fun. Caterday is always a fun day. 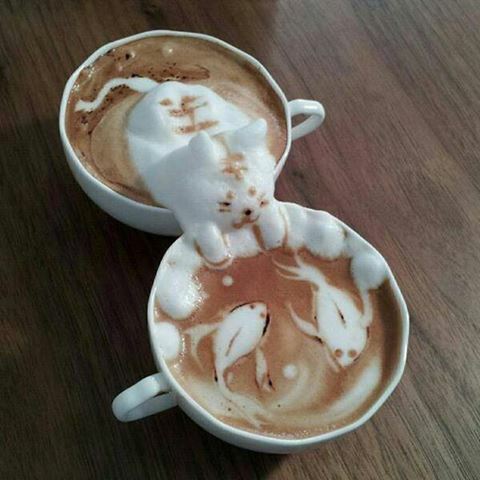 Take a break today and have a Cat-puchino. 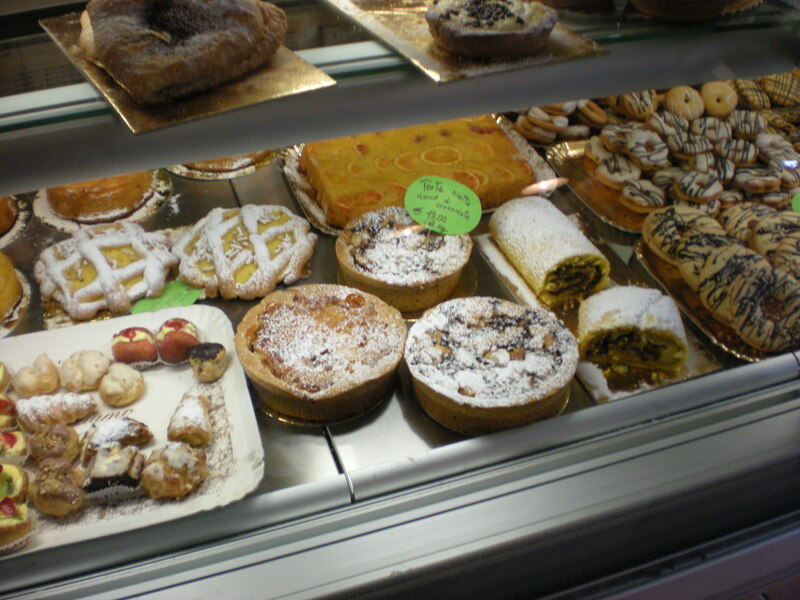 or a limone tarte, carnetto (sweet croissants), la sfogliatella (filled, flaky-layered pastries), crostata di frutta (fruit-filled rustic tarts), tiramisu, an amaretti (small amaretto-flavored cookies). 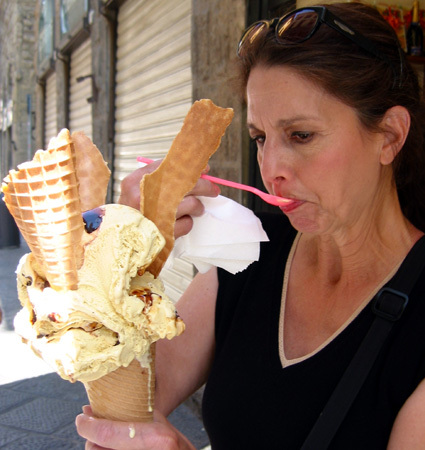 Each delectable offering is irresistable and taunting. How can I just choose one? How about a little of this and a little of that. And maybe that other one for later in the morning. 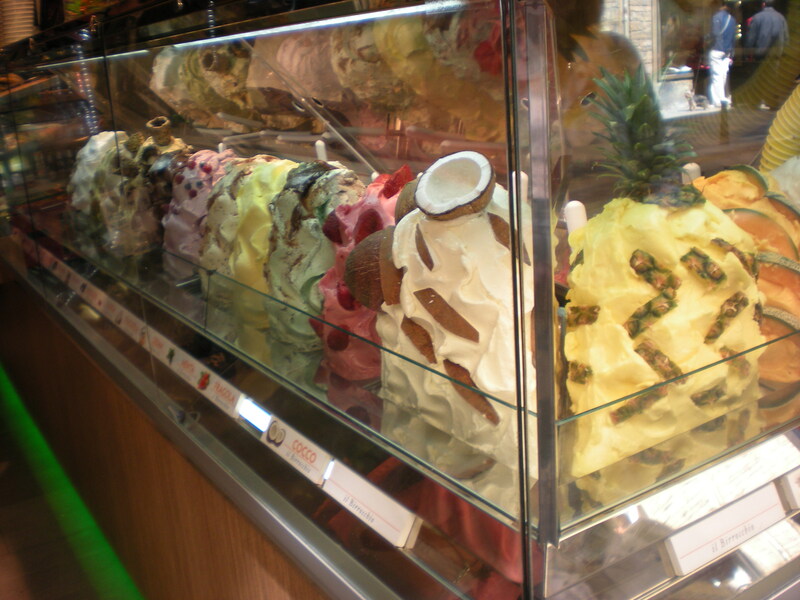 It’s just as bad as going into a gelato shop and having to choose one flavor. Nope, it can’t be done. And choosing a favorite quote is as hard as choosing a favorite kitten from a box of sweetie-pies sitting outside the neighborhood grocery store. Just impossible. But I must admit, that I do have a few favorite quotes that I toss out from time to time. 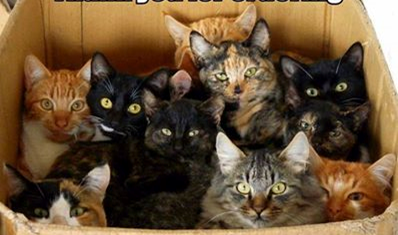 And wouldn’t you know, most of them are about: cats. 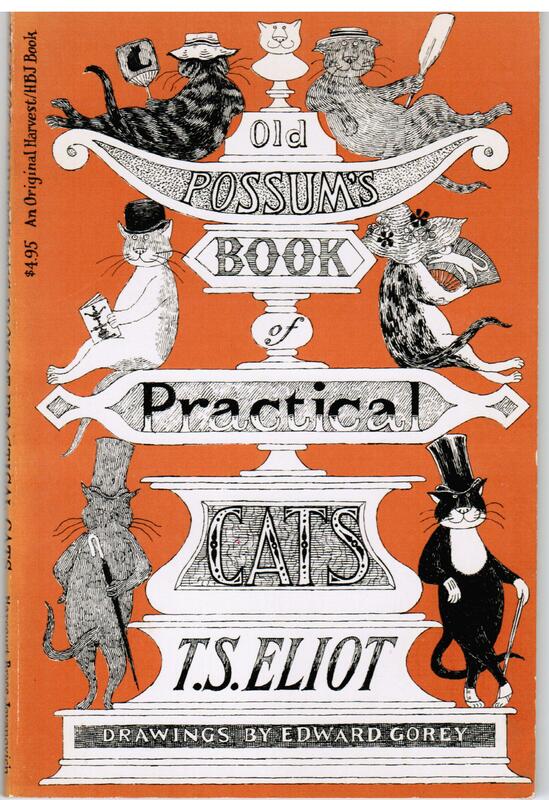 Cats and poems about cats make me smile. It isn’t one of your holiday games. A name that’s peculiar, and more dignified. Or spread out his wishers, or cherish his pride? There’s more to this delicious cat-naming silliness, but you’ll have to pull it up on Internet yourself. But above and beyond there’s still one name left over. 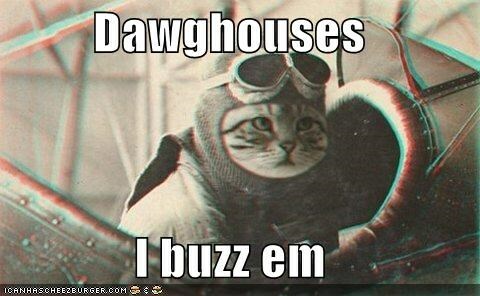 But the CAT HIMSELF KNOW, and will never confess. 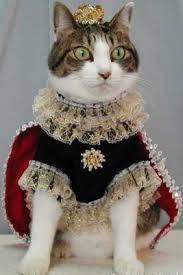 By the way, what have you named the royal king, queen, prince, or princess in your household? And does your cat approve of this earthly name? I’ll write a post next week on the royal names you send to me. 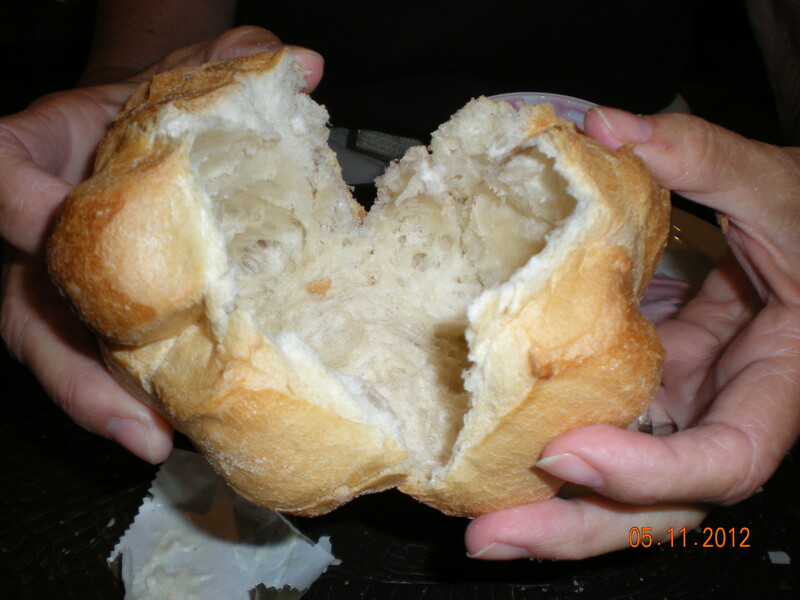 Hungry, but self-sufficient, Alaskans plan ahead for the long, cold winter. They fish for salmon and halibut in the summer and hunt for moose in the fall. Everything they harvest for personal use goes in the freezer to be enjoyed when the temperatures fall below zero and the snow piles high in yards and on roads. The fishing and hunting seasons requires fortitude, stamina, patience, determination, and above all, a sense of humor. If you go salmon fishing, prepare for the crowds. 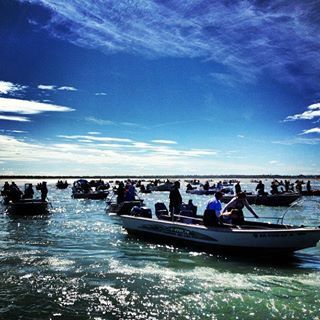 Eager fisherpersons line the shores of the Kenai river “shoulder-to-shoulder, cooler-to-cooler, and dipnet-to-dipnet.” And when you dipnet, prepare for surprises. Fishing from shore on the Kenai River is bad enough, but put those eager fisherpersons in boats and watch out for a Traffic Jam, Alaska-Style. See more Alaska pictures in the KTUU.com Photo Gallery: KTUU: Picture of the Day. Now wait. Just. One. Tiddly. Minute. You get all those fat fish, and all you give me are these two stinkin’ mini-dudes? Something is not right here. You had better get your priorities straight. Right now. I want that nice, fat, juicy sockeye salmon over there next to that hot grill. The Kenai River on the Kenai Peninsula, two and a half hours south of Anchorage by car, may be the best place for Alaska residents to dipnet for salmon to fill their freezers, but Brooks Camp in the Katmai National Park and Preserve is the place to go to watch bear catch salmon. The only access to the remote Brooks Camp is by float plane or by boat. Salmon run in a five-year cycle from eggs hatching to their returning to spawn (National Geographic video). Their journey is not easy, and once at the end of the journey, the females lay their eggs, the males fertilize them, and then they die. Ever hungry and watchful bears end up with tasty dinners, even if it’s only left-overs. 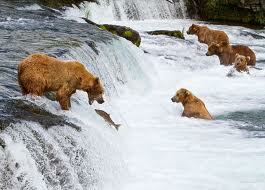 Here’s another view of a lucky-unlucky-lucky bear fishing for salmon. Planning a fishing trip to Alaska? You can start here: Katmai National Park and Preserve. You can read my earlier posts on Alaska (I lived there for ten years) by clicking on the titles below. Two Oceans Meet in Gulf of Alaska? Not! You humans may be scaredy cats, but look at what I do when a bear has the nerve to step his claws in my backyard. Ocean City: Ready for Visitors! 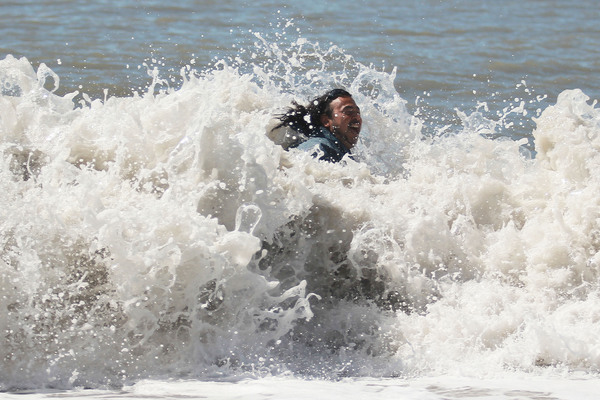 After the devastating Superstorm Sandy went through our area last October, things looked quite bleak. But with everyone pitching in to help, the Jersey shore looks much better now. 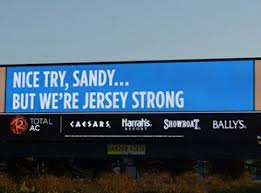 Of course, some areas of New Jersey and New York still need more help and more work, but they, too, will recover. Ocean City, in the meantime, is ready for company. C’mon down. Here’s one more weekly fun event in Ocean City. 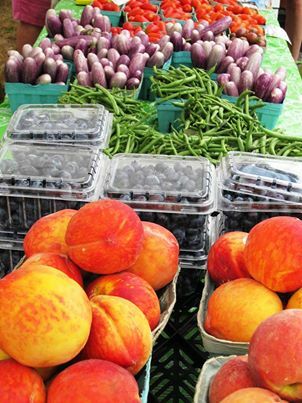 Wednesday is Farmers and Crafters Market Day in Ocean City on the Tabernacle Grounds at 6th Street. Come get your “Jersey Fresh” produce. 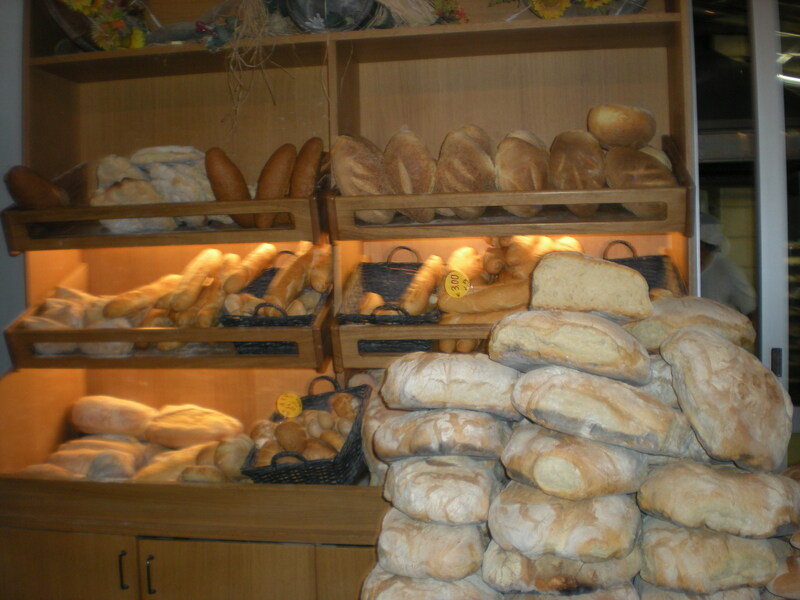 The market opens at 8 am. Hey! What’s going on here? Word on the street says this garden has catnip. But this just looks like stinkin’ parsley. What gives? Where are you hiding the good stuff? 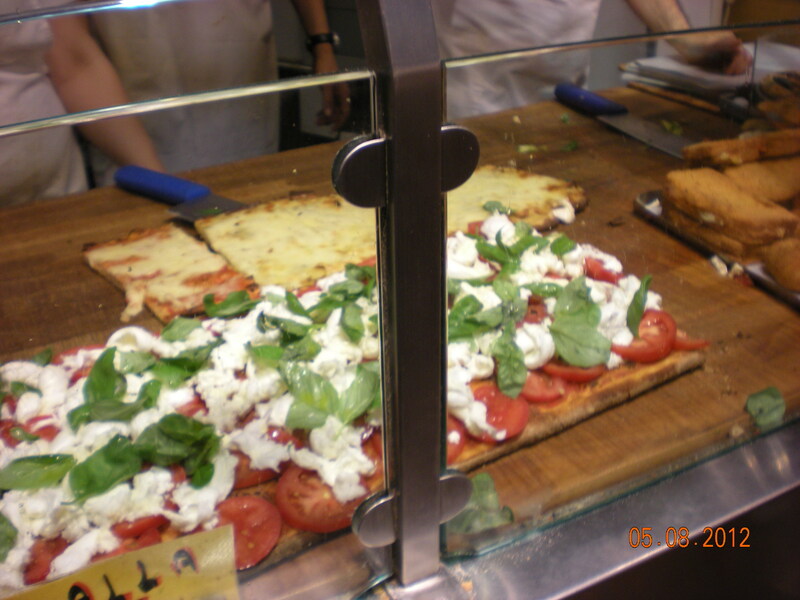 Now I really have to go back to Hong Kong! I’ve had high tea there a number of times, but never like this! Traveling to Hong Kong this Summer? 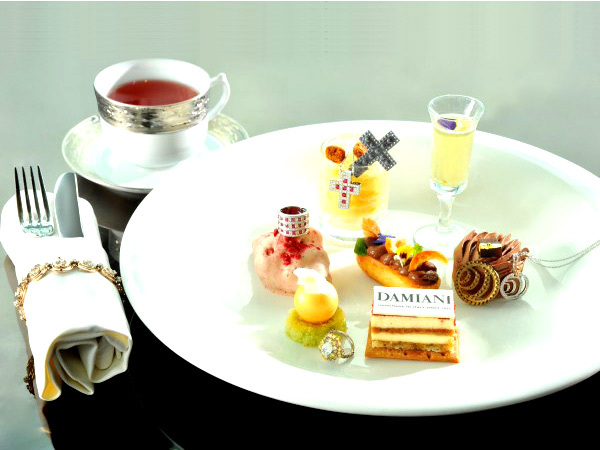 You don’t want to miss this exquisite high tea (that’s afternoon tea for most people) event in collaboration with Italian jewelry brand, Damiani, at The Ritz-Carlton in Hong Kong. 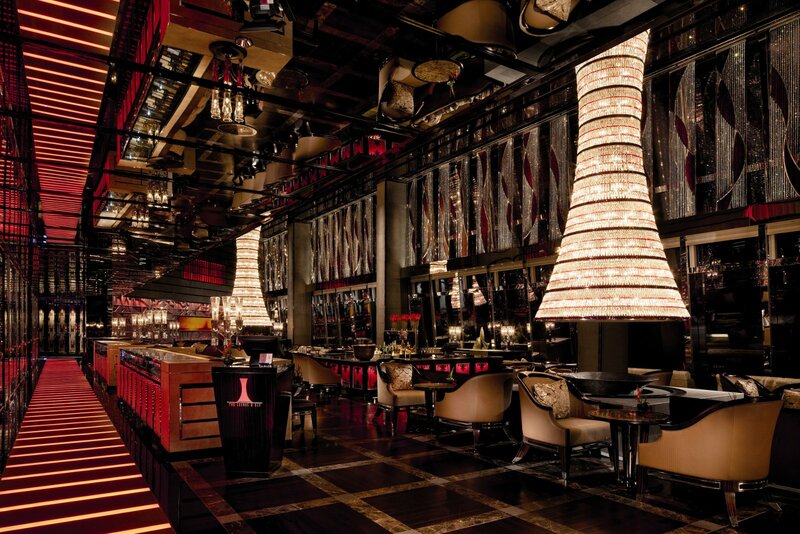 The Lounge and Bar at the hotel will be offering a special afternoon tea inspired by the jewellery brand’s latest collection of unique and precious jewels named Belle Epoque.